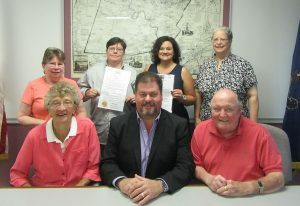 Wyoming County Commissioners (seated, from left) Judy Mead, Tom Henry and Ron Williams congratulated Diana Yaskiewicz (back, second from left) for her success with the Bradford/Wyoming County Literacy Program at yesterday’s commissioners meeting. Also representing the agency were (back, from left) Vicki Vannan, Aubrey Carrington, and Laurie Anson. 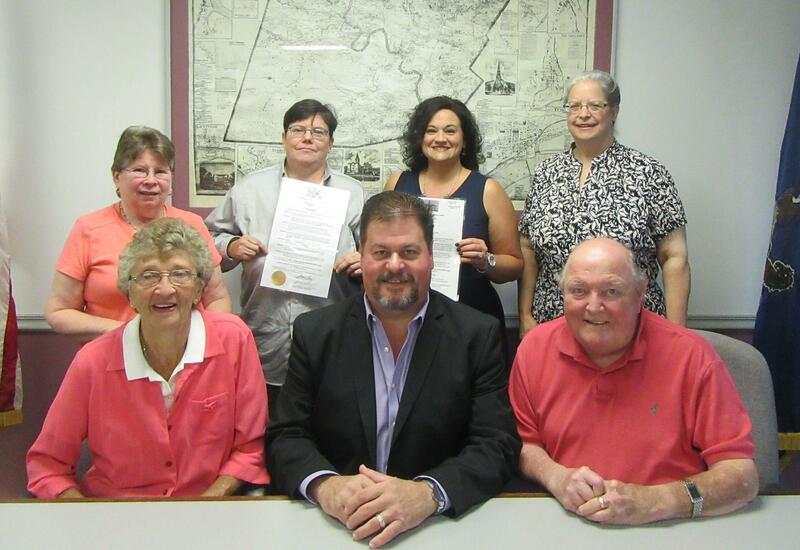 Representatives of the Bradford/Wyoming County Literacy Program made their annual visit to the Wyoming County Commissioners on Sept. 5, bringing with them a 16-year participant in the program with a remarkable story. They were there to mark National Literacy Week and National Adult Basic Education and Family Literacy Week. Diana Yaskiewicz explained that she graduated from high school without being able to read newspaper stories or even a map. With the help of volunteer tutors like Laurie Anson, she was able to increase her literary skills from a second- to seventh-grade reading level, which allowed her to enroll this year at Luzerne County Community College. Yaskiewicz has started with general studies but has ambitions of graduating with a degree in welding. Long-time Literacy Program advocate and ESL instructor Vicki Vannan noted that Yaskiewicz has also held several part time jobs while pursuing her studies, which would not have been possible without her participation in the program. Commissioners Ron Williams and Judy Mead complimented Yaskiewicz on her choice of welding as a career, noting their services will always be in demand. Vannan, Yaskiewicz and Anson were joined by program coordinator Aubrey Carrington. Vannan related that participation in English as a Second Language courses in Laceyville and Tunkhannock fluctuates and is down currently. On the other hand, she was happy to report that interest in volunteer tutoring in on the increase. A new course for tutors will be offered at the Tunkhannock Public Library in November. When asked by Commissioner Tom Henry for details on the tutoring program, Anson replied that the needs are “student-driven. If you want to be able to read to your grandchildren, we’ll help you with that.” Tutors can help parents with relatively simple tasks like understanding their children’s report cards, as well as help people to achieve their GEDs. Courses geared to help people obtain commercial drivers licenses (CDLs) have also proven popular. Commissioner Mead read one of two proclamations in honor of the guests, acknowledging the importance of basic adult education and family literacy. Celeste Kranick, regional representative for the Addict’s Mom, had recently returned from the FedUp Rally in Washington D.C., which was promoted as a federal response to the opioid epidemic. “I wanted to come in here in a happy mood, but I’m very discouraged,” she stated as she sat down with the commissioners at the board table. After participating with thousands of Americans who fully understand the dynamics of addiction and who are dedicated to coalescing the many resources available to effectively tackle the scourge, Kranick related that coming home to stories from Laceyville residents that meth labs are popping up throughout the town and that discarded hypodermic needles have become commonplace is heartbreaking. Kranick charged Laceyville and Meshoppen police and the county district attorney with turning a “blind eye” to the crisis. “Does the county have any authority over town cops?” she asked. The unanimous response was “No,” and Commissioner Mead remarked that it is discouraging to hear that local authorities are not taking more proactive measures. Kranick requested a renewed bipartisan approach to the opioid epidemic, including dedicated space in county-managed transitional housing. “That’s what we’d hoped for those facilities in the past,” said Commissioner Henry, who noted that use of transitional housing only for participants in the Drug Treatment Court program has been a matter of contention in the past. “As commissioners, that’s what we’d like to see too,” Henry said of Kranick’s request. Nonetheless, the commissioners were in agreement that some progress has been made since last year’s addiction awareness rally on Courthouse Square, and he complimented Kranick and Lizz Dewolfe of Not One More in Wyoming County, who was also in attendance, on their continued efforts to give hope to those affected by addiction and steer them toward viable resources. “We have tried to do whatever is possible to help with the situation,” Henry remarked. “I don’t know that things will ever be perfect, but I think that more people understand the disease.” He also suggested that the stigma associated with addiction among county residents has been lessoned somewhat. Williams told Kranick that she should be encouraged by the fact that the federal government has finally brought addiction awareness to the forefront and made overtures toward addressing the crisis from the top. He also suggested that she reach out to District Attorney Jeff Mitchell again. Not One More in Wyoming County will hold its second rally on Saturday, Sept. 9 from 1 to 8 pm in Lazy Brook Park, east of Tunkhannock. The event will feature inspiring speakers, live music, and many vendors offering resources to combat addiction, as well as food and activities for children. Commissioner Henry read a letter from state attorney general Josh Shapiro commending the board for its recent support of a proposal by Fair Districts PA to form a bipartisan panel to reshape Pennsylvania’s legislative districts to better reflect regional needs, ideologies, and cultural differences, rather than by party affiliation, as had become the norm. The commissioners reported that the lease for the Wyoming County Conservation District, which currently has an office on Hollowcrest Road, would be extended for three years. At a recent meeting, plans were discussed for the construction of a new office building on Jayne Road. Land has been acquired there adjacent to the Rice farm, where the conservation district has conducted activities for youths in recent years. The agency has operated from the Hollowcrest location for at least 20 years. President Judge Russel Shurtleff requested and was granted $1,500 for the Kids First Program, which provides counseling services and activities for children caught up in divorce situations. Commissioners Henry and Williams participated in the opening ceremonies last Wednesday evening that preceded the crowning of the Wyoming County Fair Queen. Williams also spoke at a ceremony on Saturday that was dedicated to military veterans. Henry and Williams participated in a round table discussion on opioid abuse held last Wednesday afternoon. Commissioner Mead was on vacation last week. The commissioners unanimously approved the hiring of Elizabeth Foster as a case manager and administrative assistant in the district attorney’s office. 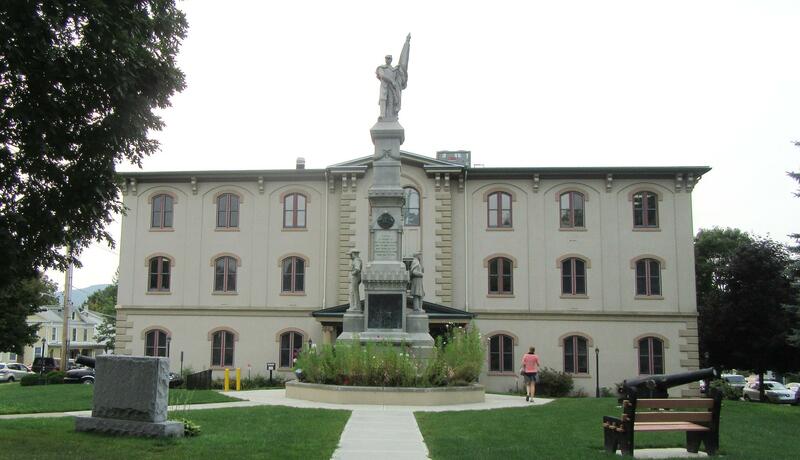 The next public meeting of the Wyoming County Commissioners will be held at 9 am on Tuesday, Sept. 19 at the courthouse in Tunkhannock.